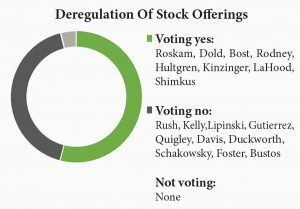 Deregulation Of Stock Offerings: Voting 236 for and 178 against, the House on Sept. 8 passed a GOP-sponsored bill (HR 2357) that would roll back Securities and Exchange Commission regulations to enable unproven smaller companies, both public and private, to market their securities with fewer investor protections. In part, the bill would authorize start-ups traded on public exchanges to use a simplified securities-registration form that is now available only to established companies that have met SEC transparency and financial-stability standards. The bill also loosens SEC registration requirements for private offerings aimed at raising up to $500,000 from a limited number of investors. A yes vote was to send the bill to the Senate, where it was expected to fail. 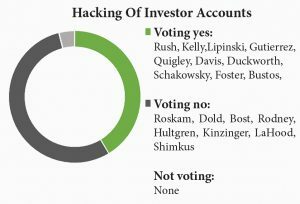 Hacking Of Investor Accounts: Voting 180 for and 233 against, the House on Sept. 8 refused to require companies raising capital under HR 2357 (above) to inform the Securities and Exchange Commission of cybersecurity measures they have put in place to prevent hacking into customer accounts. A yes vote was to adopt the Democratic motion. 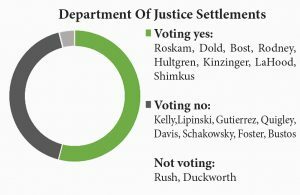 Department Of Justice Settlements: Voting 241 for and 174 against, the House on Sept. 7 passed a GOP-sponsored bill (HR 5063) governing Department of Justice settlements in civil litigation against corporate defendants. At present, the department often allocates a small share of settlements to outside organizations for broad remedial actions that benefit non-parties to the litigation. For example, in a recent $5.06 billion subprime-lending settlement, Goldman Sachs agreed to finance loan forgiveness and affordable housing for the benefit of classes of aggrieved individuals not party to the case. Under this bill, any fines not paid directly to injured parties must be allocated to the Treasury rather than third-party groups. 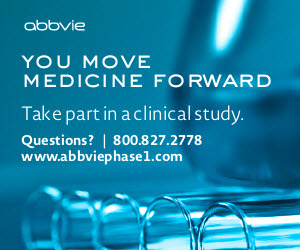 Backers said this would prevent the administration from establishing “slush funds” to benefit of its political allies. Opponents said the bill would spur corporate abuses such as fraudulent mortgage-lending and workplace discrimination. A yes vote was to pass a bill backed by the U.S. Chamber of Commerce and opposed by consumer and community-housing groups. Settlements For Sexual Harassment At Work: Voting 178 for and 235 against, the House on Sept. 7 refused to exempt from HR 5063 (above) settlements paid by corporate defendants in cases based on job discrimination and sexual harassment and violence in the workplace. The amendment sought to allow settlements in such cases to be used to finance generalized remedial actions by third parties in addition to providing restitution to the specific parties to the case. 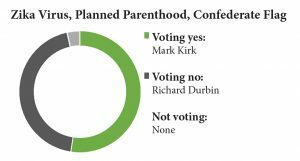 Zika Virus, Planned Parenthood, Confederate Flag: By a vote of 52 for and 46 against, the Senate on Sept. 6 failed to reach 60 votes needed to end Democratic delay and advance a bill (HR 2577) that would fund fiscal 2016 budgets for veterans, military construction and housing programs. The bill includes $1.1 billion for combating the mosquito-borne Zika virus now spreading in the United States. Democrats based their filibuster on GOP-sponsored language in the bill that would ban Planned Parenthood funding of Zika-related reproductive care, allow unfettered display of the Confederate flag in national cemeteries and ease federal regulation of pesticides. When contracted by pregnant women, Zika can cause microcephaly, a birth defect in which the baby’s head is smaller than expected. A yes vote was to advance the bill toward final passage.